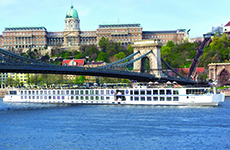 It's only fitting that Europe's enchanting Danube, with her glorious international jewels — Budapest, the “Queen of the Danube”; Vienna, the “City of Waltzes”; and Bratislava, the “Coronation City of Kings” — welcomes another gem to her sparkling collection: Uniworld's ultra-luxurious S.S. Beatrice. Launched in March 2009, the River Beatrice is quite simply the most deluxe and comfortable ship ever to sail any European river. Her exquisite grace and refinement make her the perfect match for the enchanting Danube River region.